Edward II Plays Character Analysis of Piers Gaveston in Christopher Marlowe's "Edward II"
Character Analysis of Piers Gaveston in Christopher Marlowe's "Edward II"
King Edward’s “French minion”, Gaveston is a remarkably well delineated Marlovian character. It is important from the point of view of the conflict in the play – the conflict between the sovereign and the barons of the realm. He is the central of all ruptures. But it’s not Gaveston alone who ignites the trouble; there is something in the nature of Junior Mortimer which flames and sets it on conflagration. The character of Gaveston has limited individual drawbacks, which have been exaggerated by the opposition. In structure the character of Gaveston is simple and not of complex in the sense. His faults and foibles float on the surface. Had King Edward bestowed his mad affection on him we would hardly have been recognized on the street. He is proud, egoistic and with a vein of hatred for the barons. According to the historical source, Gaveston came of a blue blood family. His father Arnold Gaveston was a Gascon Knight in the realm of Edward I. In an early age, Gaveston was banished from the kingdom for exercising corrupt influence on the Prince (Edward II). But when Edward II had become the King he recalled his once-bosom friend, Gaveston. Titles were heaped upon him. He was made the Earl of Cornwall and was married to King’s niece Margaret de Clare. The infuriated barons killed him finally in June 1312, for they could hardly break the rise of a mere upstart. Take a look- Christopher Marlowe's Edward II as a tragedy. Thus we find that hatred is not a one way traffic in the play but tow way traffic. Hatred breeds hatred and this is the crop that they reap in Edward II. Hatred coupled with egoism becomes the sole cause of the ruin of those who are involved in it. The egoism and haughtiness of Gaveston is the remarkable trait of his character. He does not care anybody else except the King. He frankly states “My knee shall bow to none but to the king”. He jeers and boos at the persons of the exalted rank, who in turn take umbrage at his behavior. But such thing does not deserve the sword to be drawn for killing him. Does he deserve death for being an incorrigible egotist? The answer surely would be a big “no”. He has been more sinned against than sinning. From the perspective of portrayal, Gaveston’s character can be easily called a flat character. He remains the same from the beginning to the end. But in spite of being flatness his character is not dull. It is because of his being intensely drawn by Marlowe. Is Gaveston a ‘base’ character often accused by Junior Mortimer in the play? There is hardly any baseness in him. Really the base character is that of Mortimer himself. A little introspection on his part would clearly reveal the fact. To be ambitious is not base, but he is not more ambitious than Mortimer. Who does not love status and wealth? It is a common human weakness to which he is prone. To sum up, the character of Gaveston has been drawn in a way so as to form the crux of the events. Again his character shed light on the character of the king. The events are ignited by the fuel added by Gaveston. The barons may hate them and the Queen too, but the readers and the audience do not. Though the character of Gaveston cannot be called an ideal one for his hubris, yet it does not mean he is given death sentence. 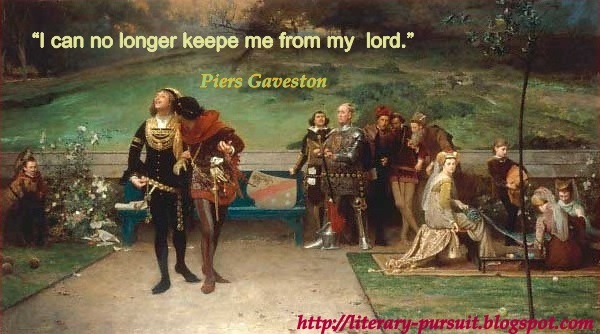 If the barons could be proud of their power and pelf, why not Gaveston who has the privilege of the love of the King?